Steps for the windows installation of Apache HTTP web server 2.2.10 . Go to download Apache from official website : http://httpd.apache.org/download.cgi . Here you will find out the latest version ( i am using version 2.2.0) . Get Win32 binary installer ( apache_2.2.10-win32-x86-no_ssl.msi) . Once you have clicked on the executable, a screen should come up that looks like this. Go ahead and click on next . Of course you plan to abide be the license agreement, so click on I accept…. and click on next. You really don’t need to read this, but if you want you can. Read it if you want feel informed. When you are ready click on next. Here is where the actual setup of Apache Windows Installation begins. For Network Domain put in localhost as for Server Name You want these both to be localhost because the server is running locally, on your home computer. It doesn’t matter what is in email field, just put in yours. Now select typical ,choose a suitable drive and complete Apache 2.2.0 Windows Installation(You need administrative privileges for uninterrupted installation) . Now it is time to test your Apache Windows Installation. Click on Start > Program Files > Apache HTTP Server and look for control Apache HTTP web server >start . Click it. Once it says Apache 2.2.0 running ( or just appears and closes), press Windows Key + R and type -http://localhost/(else you can use your favorite browser and enterhttp://localhost/in URL box). If the install works you should see a page saying that it works. If all is set and done, continue to the next step. No you have to link you website files to work with Apache Windows Installation . For that , Go to start>all programs >Apache web server 2.2 >configure Apache server > Edit the Apache httpd.conf configuration file . Now it will open the configuration files of windows installation of Apache web server in notepad . Now search for a line “H:/Server/Apache2.2/htdocs” . 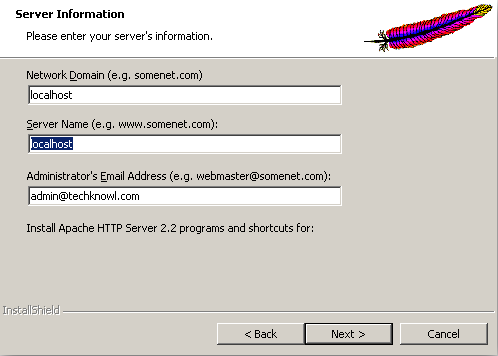 ( Here i have installed Apache in h:/server/apache2.2) and change it with the location of your index.HTML(home page of website files stored in your computer folders ) file . Similarly, scroll down and locate “H:/Server/Apache2.2/htdocs “ and change it with your index.html file location . 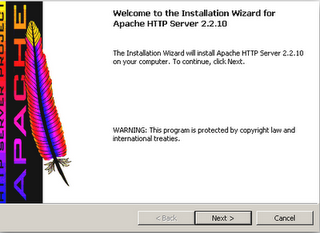 So you have completed Apache web server Windows Installation . Please read the upcoming sections to set up a complete home based web server .